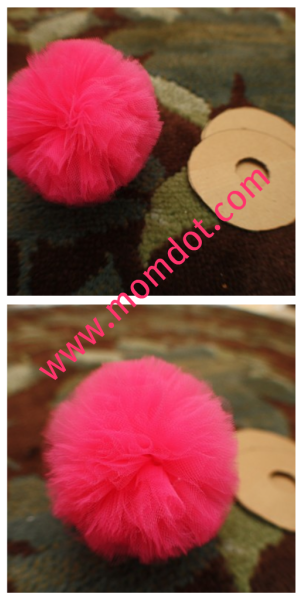 How to make a tulle pom pom ball for wands…otherwise known as, “how to make a cat toy” in my house. I made a tulle wand the other day, with intentions of giving it to my friend Kim’s daughter. But she is pretty young and if she were to pull the pins out, it could mean a dangerous situation. Not wanting to be responsible for my best friend’s child’s untimely death by lace pin, I decided to get to work on a tulle ball tutorial for all those in the same situation. Except, instead of a tulle wand, I’m going to turn my example into a cat toy for Gwen. It could also be used for hair puff pony-o’s, cheerleading pom poms, decorative shirt..um…decorations. Earrings? OK, that’s a bit too far and way too 80’s. These diy tulle pom-poms would also make adorable garland decorations above a refreshment table at a birthday party, baby shower, or a gender reveal party! 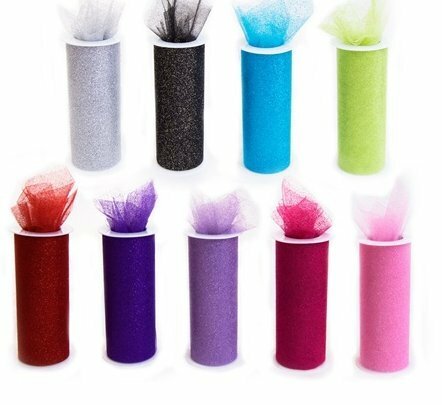 *SALE* 9 GLITTER Tulle Rolls each one 6 GET YOUR TULLE!! These size tulle rolls are easiest to make most pom pom balls. They wrap so easy! If you buy tulle off the bolts at the craft stores, they have to be cut every which way for a tulle ball and that makes the craft frustrating. Buy this awesome set I found that gives you a variety of colors for all holidays and occasions. 1) The first step: you have to decide the size of your tulle ball. I took out a glass from my kitchen, since I was making this for my kitten, and traced the edges on an old, used cardboard shipping box I had laying around. Dependent on the size you’d like, you could use a cup, a CD, a dessert plate, or even a dinner plate. The sky is the limit when it comes to these decorative tulle balls! 3) Take a string, twine, yarn, or whatever you want to use to tie the middle with. I had ribbon laying around, so I used a nice skinny ribbon. 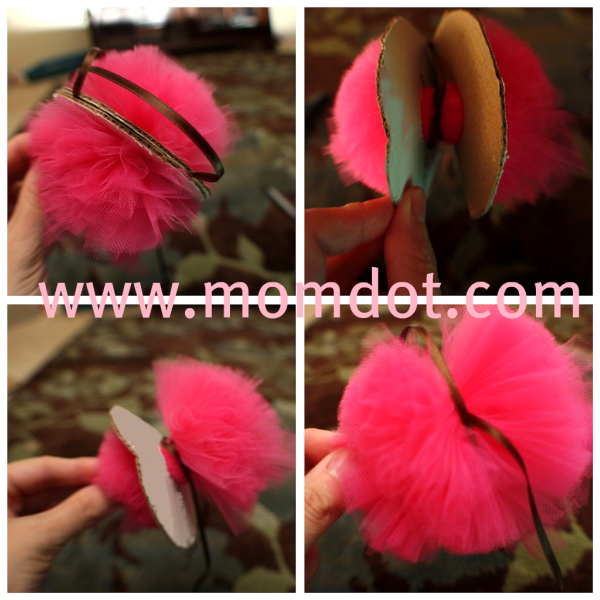 They have some really strong materials on the market if you are using your tulle pom pom ball for something that needs to hold up long term. 4) Make a loop as if you are tying it and lay it between your 2 doughnut pieces. 5) Moving on to your tulle. My pom pom was going to be small, since it was for a kitten toy, so I took about a yard of tulle and started wrapping. Just put your piece through the middle hole and then wrap around and through the hole and back out again, round and round till it’s filled up. 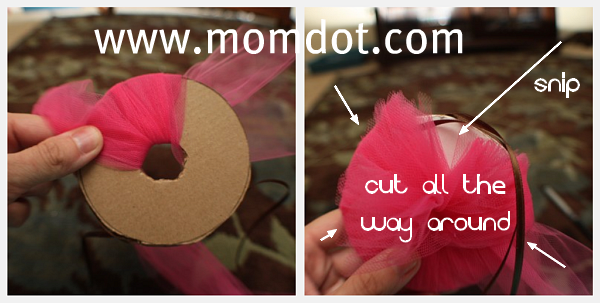 6) Take a pair of crafting scissors and cut the outside of the tulle now around the entire thing. Take care not to cut your middle string if it’s sticking out somewhere. Helpful Hint: You could also consider cutting a bit to the outside of one of the cardboard “doughnuts”, ensuring that you do not cut the string. Not too far to the outside, since you want them to be as close to even when cut as possible, but enough to ensure you don’t cut the string. Trust me, I cut mine a time or two. Be vigilant in your cutting. 8 ) Then pull off your cardboard sides and you will be left with a puffy ball. Make sure to pull the cardboard templates slowly while holding onto the other side, so you don’t tug the tulle unevenly. 10) Now you can attach it to whatever you want. Rules on attachment are going to depend on the craft you are making. In my house….well, it was just a cat toy. But now you know how to make a tulle pom pom ball!! So take it and throw! By the way, if you do want to make a cat toy, getting some crinkle paper or ribbon would also make it a ton of fun for a cat! Tulle is not the only material you could use; yarn or cut strips of fabric could also be super cute. I’m going to test out some other ideas that tie in with how to make a tulle pom pom ball. I’ll post an update when I have it. Want to see something else awesome? Try this Tutu Bow Holder – Click below to learn how to make it! you said you used about a yard of tulle. Was the tulle cut into strips before you put through the hole to wrap around? Great tutorial too btw!! How many poms can you make out of one spool? Honestly I am not sure- Ive never made a spools worth. 🙂 You must be having a party! I had so much fun following your tutorial. I made the tulle pom poms for my daughter’s baby shower. It was very simple to follow and they came out beautiful. Thank you! Thank you so much for this tutorial. I’m using the idea to add puff balls to the front of my daughter’s clown tutu costume for Halloween. Oh, our new kittens would have so much fun with these! I made them some little toys out of leftover fabric and they have a blast with them. I just might try this tutorial soon – thanks! Thank you so much! I have been wondering forever how to make these! Love your photos, btw…and the kitty is adorable! Had a small one done in 10 min! This is awesome! Thanks so much….easy cheap adorable princess party decorations for my 3 year old:). Love this idea! I have a spoiled orange cat named Simon that will love this! Thanks for the idea! You can’t beat these for washing dishes and cleaning pts and pans. Love them! That’s exactly what i plan on doing! I hope it turns out nice. How much tulle did you use for each one? Thanks for the tut, very cool BUT the reason I’m commenting is BC of the kitten. I’m NOT a cat lover AT ALL, with that being said I must admit that your kitten is the CUTEST thing I have EVER seen! The close up makes me wanna run out & get a kitten. Thanks a lot! Lol, I do love the tut. This is also my first content ever! That darn adorable kitten looking at me like that!! MAKE your day a fantastic one! aww, thanks! thats gwennie. She was a rescue and she is older now (obviously). And just as pretty and sweet as she was here. Wow, I never knew that making this could be so simple. I love it! my grandmother has made these all my life and they are wonderful for scrubbing. scrubbing dishes, tubs, you name it they work great. Too cute!! My daughter loves making these! ADORABLE!!! I love that last pic! Want to string some of these together for daughters room and put twinkle light with them =) I’m sure my daughter would love to have the cute cat with them! what width of tulle did you use to make these? I would like to make larger pom poms for a party… what width should I use? did you wrap the tulle around multiple times? Thanks! I can’t wait to make! Love love love these! I have been making tissue pom poms for a while now but get frustrated when I accidentally tear the paper as I’m fluffing them out!! 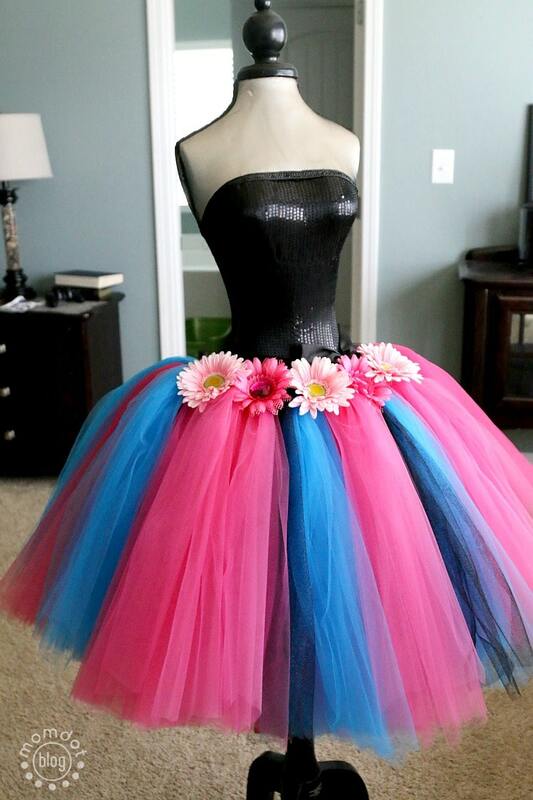 Can’t wait to get my hands on some tulle to make these. Great idea and great tutorial 🙂 Thanks! I just bought some pale ivory tulle and ribbon, I’m going to make a decorative garland to hang over the front of our bridal table with tulle pom poms. Fingers crossed mine look as great as yours! Hi, I’ve been making tissue paper pom poms and I absolutely love your tulle ones, can’t wait to go to Spotlight (I live in Australia) and get some tulle to make some for my grand daughters , thank you so much , they are beautiful. These are great! They would so cute as party decorations in different colors! To make bigger Pom poms would u need a wider tulle? No. You can use wider tulle if you want (it makes bigger strands) but you don’t have to. You can also use string to make them. They are so cute as props in pictures. LOVE them. WOW! Thanks so much for posting! I am going to make a bunch of them in varying sizes & hang them over my toddler daughter’s bed – instead of a traditional canopy. Its so ethereal & sweet – I LOVE it! Thanks again! By the way – that is the cutest kitten photo EVER! I made this for my boyfriend’s kitty and she showed no interest in it whatsoever, which is a shame because it’s so darn cute 🙁 I even sprinkled cat nip into it! I made one of these and put it on a head-band for my grand-daughter super cute. then I made tiny ones in black and put three together on a head band they are fun and cute. ahh i loved this i had to go out and buy the materials for it we have 8 cats so they will be used to pieces lol. they were so easy and fun to make thanks! SUper big help for my twins 1st bday…Thanks a lot! They are so perfect! This is a great idea! I just tried but found some empty cardboard ribbon spools and tore off each end. That way you eliminate cutting cardboard and any risk of accident. Also, you can use a small thin rubberband instead of the ribbon this way you can tightly secure it and not worry of it coming untied or not tying it tight enough and having it all fall apart. You are so crafty! I have 4 kittens that would LOVE to play with one of these. I’m very late posting to this – but you mentioned you used about 1 yard – but how wide? I’m new to the whole world of crafting so I can use all the help I can get. Did you purchase 1 yard of tulle, cut it into a ____ inch wide strip and only use *one* strip to make this pom? Thanks for any help / feedback! What a fun idea. My son loves cats, (although highly allergic to them) but he would love making something like this for his Aunt’s new kitten. Thanks for sharing. Looks like an awesome project. The kitten is so cute! Your kitten seems to a purrfect (couldn’t help my self) subject for your crafts. Such beautiful eyes too! Gwen seems to love it so much. That looks so simple to make, I may be able to do it. I adore that photo of Kitty… sweet! Love the cute tulle ball but my kitty would have it shredded in under 30 seconds. She’s a wild one!!! Ohhhhhh I want one for my kitties! Can I pay you to make me two of them? Please!